It’s perfect, really. Trout is a very meaty fish, and I know it’s a cliché, but it tastes a lot like chicken. It’s also fairly foolproof to prepare. Just grab your salt, pepper, and olive oil, put you filets in a baking tray, and roast at 350 degrees for fifteen to twenty minutes, depending on thickness and using common sense. Your fish is done when it flakes. Don’t like the skin? It peels right off. Yet it needs something else, and that’s a pork product. You can experiment with prosciutto or chorizo if you like, but I think bacon is the answer. Not only is it meaty and smoky, but it’s salty, satisfying, and most importantly, delicious. At this point, you can let your imagination be your guide, but of course, I do have some suggestions. The first is the simplest. Simply slice your bacon into one-inch strips, fry until crispy, drain, and garnish you filet before serving. Serve with your favorite seasonal veg. I highly recommend serving your roasted trout with a potato salad. This can be cold (and therefore made ahead of time) or warm (and therefore made in minutes before dinner). I have discovered the virtues of roasting the potatoes, again simply with salt, pepper, and olive oil, and then tossing one pound of them with some mustard (1 T), some mayonnaise (1/4 cup), and some herbs. I really like parsley and chives. Then mix in your crisped-up bacon, season, and you are finished. This is so easy that it can be done any weeknight. 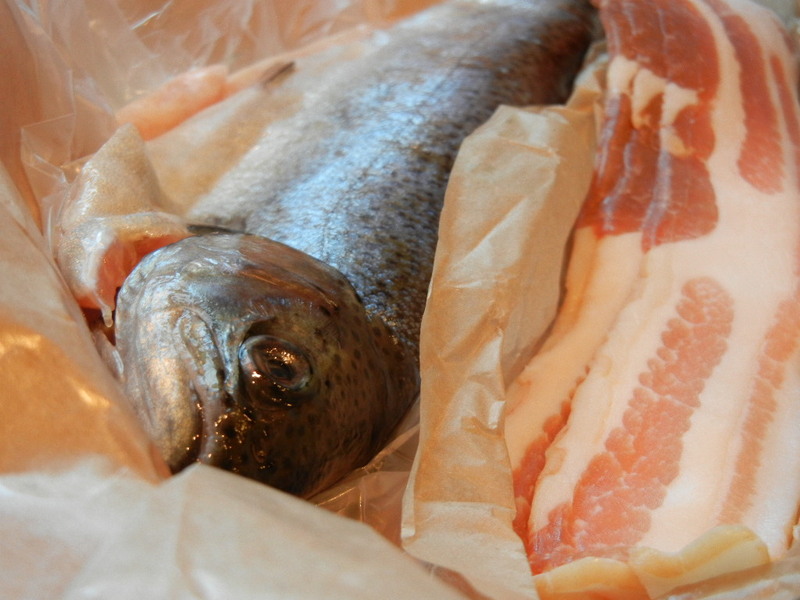 Trout is delicious, but it hasn’t attained the notoriety of salmon or sea bass, so it costs less. Serving it with potatoes won’t break the bank. Plus you’ll get some fish in your diet and add a protein to your rotation. I promise that you’ll love it. Playlist included Picking Up the Pieces, by Paloma Faith. That’s a great idea! My boyfriend complains when I put fish on the menu because it never fills him up and he ends up eating way too many carbs or snacking later. This sounds like such a good summertime dinner!